Amazon Price: $199.99 $179.89 You save: $20.10 (10%). (as of January 23, 2019 11:06 pm - Details). Product prices and availability are accurate as of the date/time indicated and are subject to change. Any price and availability information displayed on the Amazon site at the time of purchase will apply to the purchase of this product. 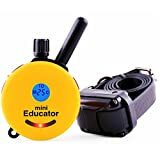 The Educator 1 Dog Mini Remote Training Collar ET-300 is a 1/2 mile range trainer that is especially made for smaller hands or for situations where discreetness is important. Utilizing "Lock and Set" technology, lithium polymer rechargeable batteries, waterproof floating remote, and waterproof receiver, the remote provides a very clean stimulation without the normal head jerking motion often found in other training collars. Includes one waterproof miniature collar receiver, one waterproof miniature floating remote, one Biothane collar, two sets of contact points (5/8" and 3/4"), contact point removal tool, dual battery charger (120V/220V) with a 2-hour full charge, owner's manual with training tips, lanyard for the remote and color storage box.